Lower intake gasket – Get the one from Ford, not Felpro. Felpro uses cork on the ends, where Ford OEM uses rubber. Ford part number F7TZ-9E439-AA The price of the OEM Ford is only $6.00 more than Felpro as well… $56.00. Ford had to order it special, but had it the next day. Upper Intake O-Ring style gaskets – I used Felpro Part Number: MS90733 from O’Reilly. You will get (6), but only need three of them. Its only $5.00 for the kit, so not a big deal. Thermostat – (195*) Murray Part Number: 3199 from O’Reilly – $5.00. 7 out of 10 wrenches. (lots of stuff to keep track of, and lots of connectors and vacuum lines to keep sorted out. You will also have to remove damn near everything from the top of the engine to do this repair. Plan on spending an entire afternoon to a whole day doing this job, and that is if you have all the parts you need on hand before you start. 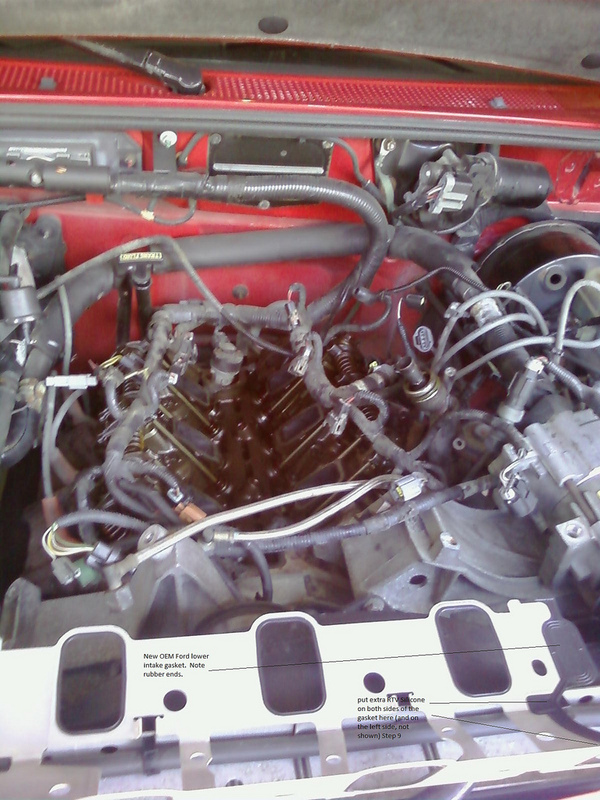 To replace the valve cover gaskets, you will need to remove the upper intake manifold. Remove upper intake: Please refer to pictures below. 1. Disconnect negative battery terminal. You don’t want to damage any sensors or the pcm. 2. 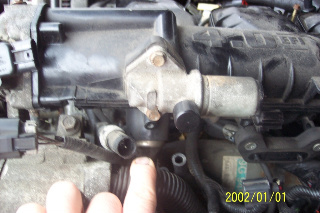 Remove the rubber hose that connects the oil fill neck on the passenger side valve cover from the intake tube and valve cover. It should just pull off of both ends. 3. Disconnect the air charge temp sensor. Leave sensor in the intake tube. 4. Remove plastic throttle cable shield from throttle body. This is held on by 2 8mm screws. 6. Separate the throttle cable from the cruise cable. They are just snapped together. Tuck both of these aside and out of the way for now. 7. Remove intake tube from air filter and throttle body. It is secured by a large hose clamp on each end. 10. Disconnect brake booster vacuum line from the Upper Intake. 12. Remove PCV valve hose from upper intake and PCV valve. 13. Disconnect the upper engine harness. This is done by a single 10mm bolt in the middle of the connector. 14. Slide the bottom half of the harness off of the metal rail. 16. Disconnect wire harness from coil pack. 18. Congratulations! You now have enough of the crap removed so that you can actually remove the cussing upper intake! 19. Take some time now to use the air hose (if you are so lucky to have an air compressor in your garage) and blow the debris out of the intake area before you go further. If you don’t have shop air, get a can of air and blow it out. This should help with stuff falling into the engine. 20. Grab a ratchet, 6” extension and a 13mm socket and remove the 6 nuts holding the upper intake. 21. Give the intake a smack with the heel of your hand to break the seal of the gaskets. Lift and pry (gently) straight up. You will have to work with the egr tube. It sticks into the intake about 2-3 inches. Keep working and prying and you will eventually free the intake assembly. 22. Replace the three o-ring type gaskets in the bottom of the upper intake. Set the intake assembly aside for now. 23. Congratulations, you are now done with removing the upper intake. Now for the Valve covers: Please refer to pictures below. 2. Take a 3/8” ratchet and take the tension off of the serpentine belt enough so that you can remove the belt. 3. Remove the alternator. It is held on by three 13mm bolts. 5. 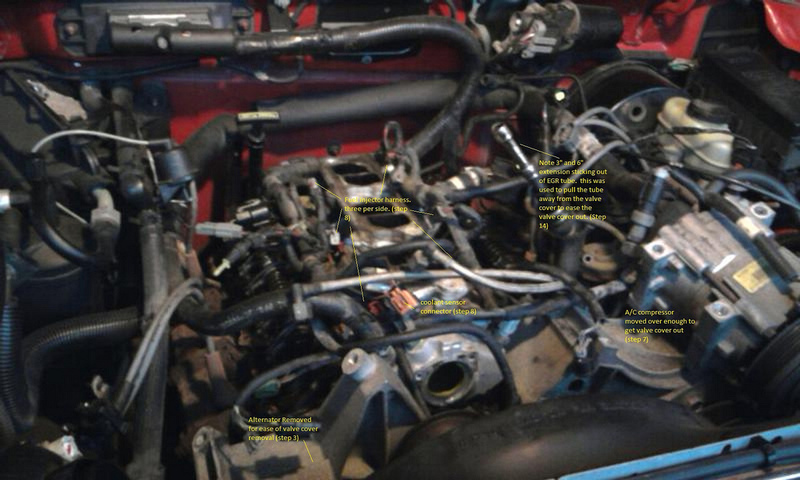 Remove the upper radiator hose. 6. Remove the heater hose from the lower intake. 7. Unbolt the A/C compressor (if so equipped). You do not have to discharge the Freon. Just remove the four long 13mm bolts and swing the compressor to the side about 8 inches or so that it is out of the way. 8. Disconnect the wiring harness from the fuel injectors and the temperature sensor in the lower intake. 9. The wiring harness is held to the front drivers side valve cover and the rear passenger side valve cover by a plastic clip that goes over a 4mm stud that is one of the bolts to the valve cover. 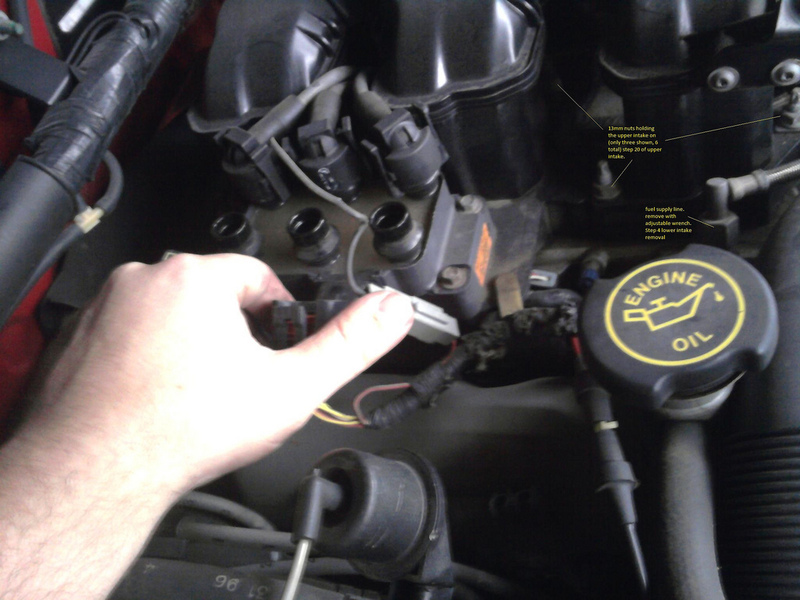 With a little wiggling and working, remove this clip from that stud on each valve cover. 10. You now should have all the bolts to the valve covers exposed. Remove them with a 10mm socket and 3” extension. Some bolts may need a universal joint to make extraction easier. There are 8 bolts per valve cover, with one of them being the 4mm stud/bolt combo on each side. 11. The passenger side valve cover should come out with minimal fuss. 12. The driver’s side valve cover will fuss quite a bit. The biggest part of the fuss will be the egr tube. 14. Take your 6” extension and stick it down the egr tube. Take a 3” extension and stick in the 6” extension. Use this assembly to gently pull the egr tube toward you (leaning over the drivers fender) as you wiggle the valve cover out. 15. Be sure to clean all the gasket surfaces on the head and intake very well and be careful not to let any debris fall into the engine. 16. Now is a good time to paint up your valve covers. Mine were rusted through, so I ended up replacing them with a set from the junkyard off of a 98 explorer. I painted mine up Ford blue. They really look sharp compared to the original gray. 17. Be sure that you put the valve cover gasket down in the correct position. Put some heat resistant RTV silicone in the area where the heads meet the intake on both sides of the gasket. 18. Decision time. You have invested a few hours and more than a few swear words at this truck by now. Do you want to go a few steps further and replace the lower intake gasket? Or do the fuel rail gaskets? If so, read on. If not, start slapping it back together. Remember, if you do need to do the lower gasket in the future, you have to repeat all of the above. If you do the fuel rail gaskets in the future, you have to at least remove the upper intake again. If you have a 1997 Ranger/Exploder/Aerostar, there is an issue (and a TSB) for the fuel rail gasket. It seems to go bad and cause a P0174 and P0171 lean code. I would go ahead and do the fuel rail gasket at the very least. It will only add about 15 bucks to your cost and very little extra labor. I went and removed the lower intake/fuel rail as a unit and did the fuel rail gaskets on the workbench out of the truck. Made it much easier to clean the gasket surfaces and injector o-ring areas. Lower intake gasket: Please refer to pictures below. 1. Remove thermostat housing. It is held on by three 10mm bolts. Note the position and orientation of the thermostat. 2. Pitch the old thermostat. 3. Disconnect vacuum line from fuel pressure regulator. 4. Remove fuel line and fuel return line from fuel rail. Use adjustable wrench. They are two different size nuts. Be careful, the fuel rail will be pressurized. Put a shop towel around the first nut you loosen to catch the spray of fuel. 5. Remove the eight 10mm bolts holding the lower intake in. 7. Remove lower intake gasket and thoroughly clean gasket mating surfaces in the engine and on the lower intake. Be careful not to get any debris in the engine. 8. IF you are doing the fuel rail gaskets, do so now (see below). 9. Put new lower intake gasket set in. put RTV silicone in the areas where the heads meet the engine block on both sides of the gasket. This will help with any imperfections in the surfaces where these parts join. 11. Put a new 195 degree thermostat with the jiggle valve in the up position into the intake and put the thermostat housing back on. 12. Start reassembling the truck. If you need to replace the fuel rail gaskets: Refer to the picture below. 2. Gently pry the fuel rail off of the lower intake and the six injectors. Note the orientation of the injectors beforehand. 3. 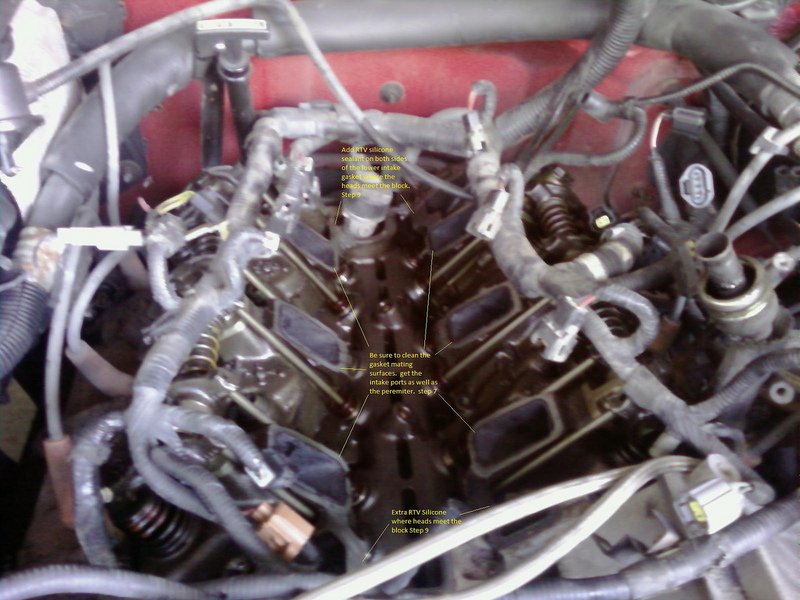 Remove all six injectors and discard all 12 o-rings. 4. Thoroughly clean all gasket surfaces and o-ring surfaces. 5. Clean the o-ring areas on all the injectors. 6. Put new o-rings on the injectors. A light film of motor oil on the o-rings will help in seating the injectors. 7. Put the injectors into the lower intake. 8. Put new paper gasket between the fuel rail and lower intake and make sure all of the injectors are seated into the fuel rail. Reassembly is the reverse of the disassembly. After you get this done, get you a cold one. Heck get two. You deserve it. 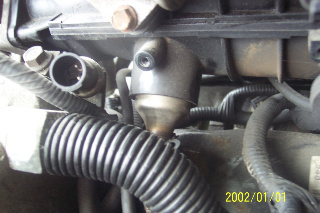 Question From: ragajungle – When you removed Plenum did the EGR tube give you problems? 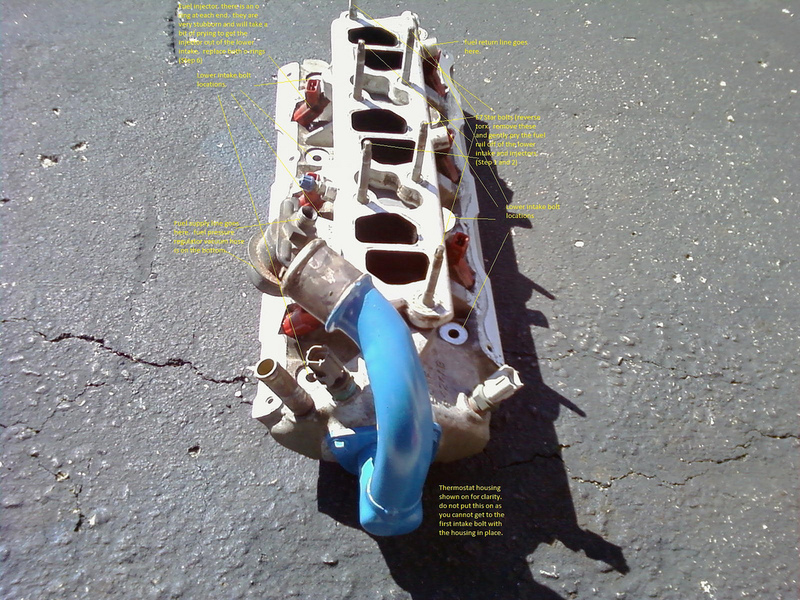 I cannot get this plenum off – it is hung up on the EGR tube. I am afraid to yank I don’t want to break it since the plenum is plastic. Also If I am just doing the valve covers do I absolutely have to disconnect the A/C? I am really trying to avoid that if possible. 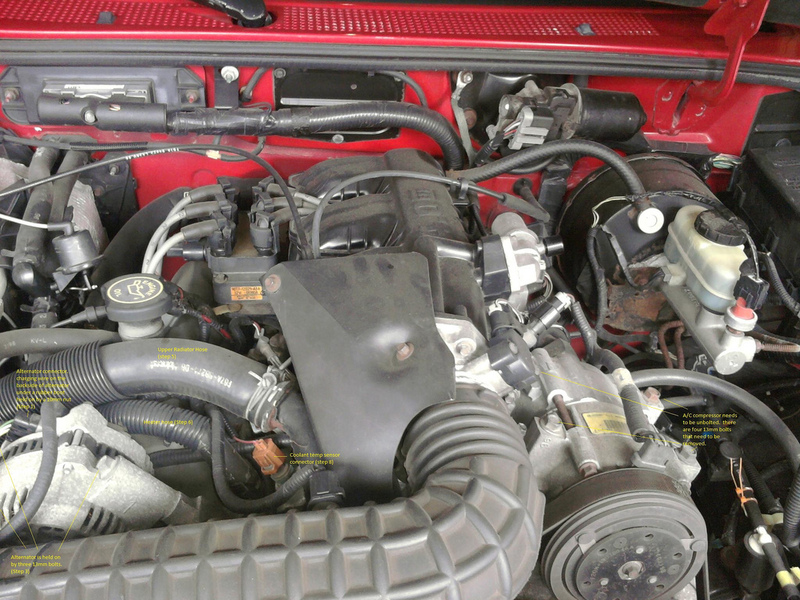 Response From 97RangerXLT – When I removed the valve covers from the truck at the local Pull a Part, the intake was amazingly difficult to remove. I fought it for quite abit because it was hung up on the egr tube just like you said. The trick that I found was to try to lift the upper intake off as straight upward as possible, get a large screwdriver to prop up the back end of it as you work the front end. 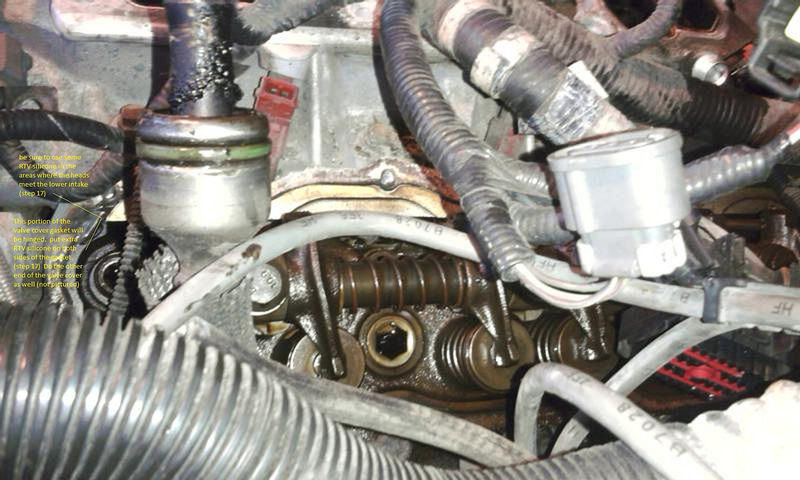 possibly what is giving you an issue is that the o-ring on the egr tube is fused to the intake. maybe shoot some pb blaster up around it and see if that helps? the intake on my truck came right out with minimal fuss, and I was expecting to have to fight it just like the one in the junkyard, but after lifting it straight up I was able to pop it off the tube. A/C question… yes you will have to remove it. 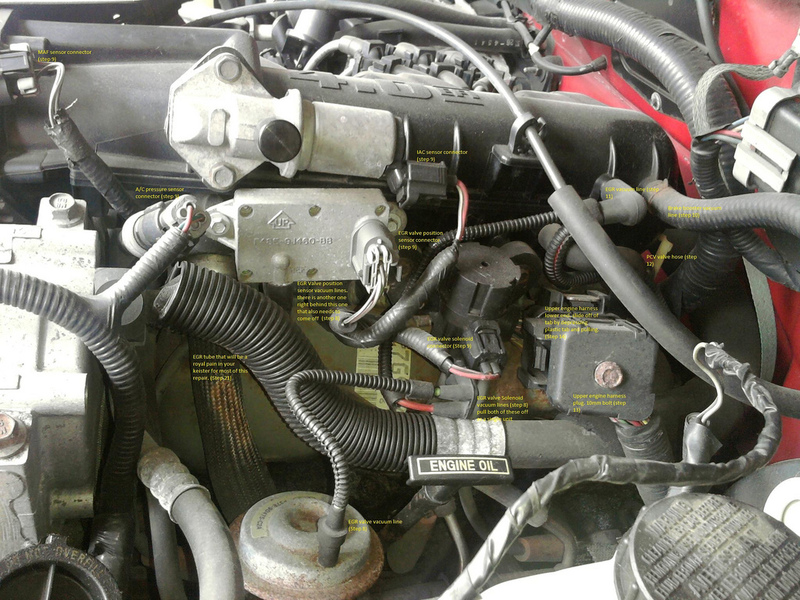 the drivers side valve cover is right below the compressor on the front of the engine, and there is no way to clear the valve lifters with the compressor in place. This will be the least of your issues tho. you do not have to discharge the system, all you have to do is remove the 4 bolts that mount the compressor and gently swing it to the side about 6 inches or so. (see pics) The hoses are flexible there to allow you to do this. To see more feedback or to ask questions click HERE.